We are Team Vertical Dissidents. We're a group of friends who discovered adventure racing during our studies, and we have participated in many shorter and longer adventure races since then. We race because we love it. We love to push our boundaries, to refine our strategies, and to discover new parts of the world. We've often heard race organisers refer to us as the ‘smiling team’. We will still have fun and make jokes even after 6 nights without sleep. And crossing the finish line after 6 days of hard work and camaraderie is just super accomplishing. Maarten is the best orienteer we know. We think he’s born with a map in his hand. He’s also the strongest kayaker of us all, and recently kayaked the Grand Canyon. But like all of us, he’s a true multisport guy and is good at doing almost every sport. He for example won the Mudmasters 24h championships in 2016. Sil is a mountain bike guide, an excellent mountaineer, and just a very strong pack horse. Sil has a road cycling background, but soon decided he prefers mountain biking, climbing and running on trails. Sil for example finished 1st in the Harz Adventure Race in 2010. Arjan is our strategist. He’ll keep an eye on deadlines, strategies, etc. He’s a strong endurance athlete, Alpinist and mountain biker. And apart from that he’s the one who will incite the strangest jokes at the strangest moments (if he's not giving us lectures about the geology we see). 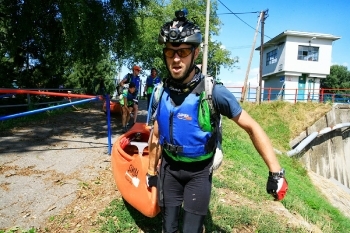 Arjan for example finished 1st in the Harz Adventure Race in 2010. Janne is among the strongest female ultra trail runners of the Netherlands, but apart from that she loves any sport as long as it has something to do with mountains, hills and speed. Usually she will just smile and keep going. And sometimes chase the boys not to loiter ;) Janne has represented the Netherlands at the World Championship Ultra Trail Running in 2016 and 2018. 11 - Vervolgens sleuren we de kano het water in, om 20 km te peddelen door typisch Nederlands landschap.